In the beginning God populated the earth with broccoli and cauliflower and spinach, green and yellow and red vegetables of all kinds, so man and woman would live long and healthy lives. Then using Gods great gifts, Satan created Ben and Jerrys and Krispy Kreme. And Satan said, You want chocolate with that? And man said Yea. And woman said, And another one with sprinkles. And they gained 10 pounds. And God created the healthful yogurt that woman might keep the figure that man found so fair. And Satan brought forth white flour from the wheat, and sugar from the cane, and combined them. And woman went from size 2 to size 6. So God said, Try my fresh green salad. And Satan presented Thousand Island Dressing and garlic toast on the side. And man and woman unfastened their belts following the repast. God then said, I have sent you heart healthy vegetables and olive oil in which to cook them. And Satan brought forth deep fried fish, chicken-fried steak so big it needed its own platter. And man gained more weight and his cholesterol went through the roof. God then brought running shoes so that his children might loose those extra pounds. And Satan gave cable TV with a remote control so man would not have to toil changing the channels. And man and woman laughed and cried before the flickering light and gained pounds. God then gave lean beef so that man might consume fewer calories and still satisfy his appetite. And Satan created McDonalds and its 99-cent double cheeseburger. Then said, You want fries with that? And man replied Yea! And super size em. And Satan said, It is good. And man went into cardiac arrest. The irony in this funny little story is that it is almost true. The error is that it has been a devil of our own making called American capitalism that created all of the deadly variations to turn good food into bad. It was the capitalist system that brought us radio, television, cars, motorized golf carts and all of the other devices that turned us into couch potatoes. And it was capitalism that turned health insurance into a greedy empire conspiring against the people who need it the most. 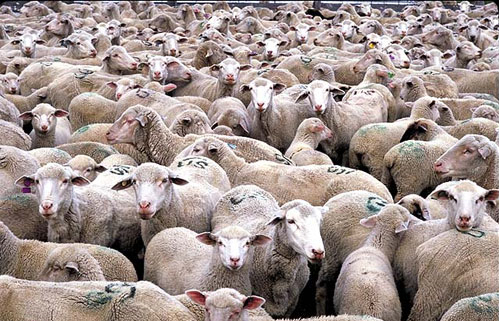 Americans have consequently become a nation of overweight, unhealthy sheep who have lost their ability to think. We are skillfully manipulated through subliminal messages delivered via our televisions, radios and the Internet. We can be programmed to buy certain products, watch certain films, elect certain leaders, and even go to war without cause, almost at the flip of a switch. Why, for example, do you think the people would collectively agree to allow their president to declare a universal and unending state of war against a political philosophy called terrorism which can never be won? Or willingly allow our leaders to dismantle the freedoms we once enjoyed through the U. S. Constitution and the Bill of Rights, all in the guise of protecting us from terrorism within? And why would we just yawn and turn up the air conditioner another notch when our leaders and some so-called weather "experts" assure us that the record heat waves, flaming forests, and crazy weather patterns are not caused by global warming. We even allowed former President George W. Bush, during his time in office, to drop the lawsuits brought by the Environmental Protection Agency against several big electric companies with coal burning plants that were in gross violation of the Federal Clean Air Act. That we have used this so-called war-on-terrorism to attack Afghanistan and then Iraq, and to use drones to bomb targets in various other nations in pursuit of radical Moslem leaders believed linked to the 9-11 attack on America, was an act of terrorism far worse than anything Osama bin Laden brought against us. There were slightly less than 3000 people killed in the attacks on the World Trade Center and Pentagon. As of December, 2001, our bombs were known to have killed an estimated 3,700 innocent civilians in Afghanistan alone. We also destroyed homes, crops and food sources. And the killing continues in that country to this day. And we believe that we are a peace-loving nation. But let's not worry about that stuff. How about some dip with those chips and beer when we gather in front of our television screens tonight? The talking heads will tell us what to do.